Spread love in your life but also spread delicious things on your toast. Welcome to Week 6 of #HOMwork! 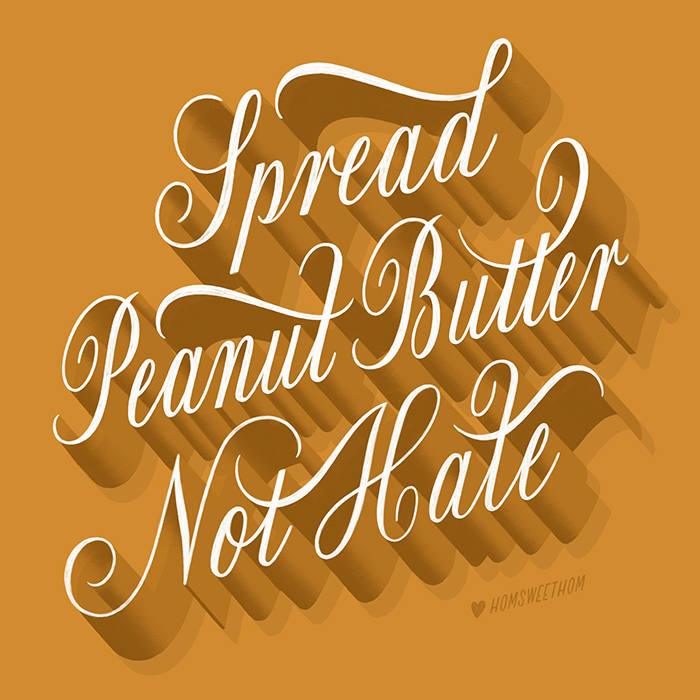 Your assignment this week is to take the popular phrase "Spread love, not hate" and replace 'love' with your favorite thing to spread onto food (hummus, nutella, butter, vegemite, etc). The goal of this challenge is to put a playful and surprising twist on a familiar phrase (noticing a pattern yet hehe?). Good lettering + unique content has been my social media strategy from the start. This is why I'm always encouraging you to practice lettering things that deviate from the typical phrases you might find in your local drugstore greeting card aisle. Whenever someone asks me, "How do I get more engagement on my Instagram posts?" my answer is usually, "Make more engaging content." I've been receiving SO many sweet messages from #HOMwork participants saying that they've seen a huge boost in likes, comments, and followers after joining the challenge! This makes my heart so happy because, like I've mentioned before, I truly believe that *what* you letter is just as important as *how & why* you letter it. As always, the second part of the challenge is to snap a photo of your drawing and post it on Instagram with the hashtag #HOMwork so we can see what everyone created. In the caption, tell us 1) why this yummy spread is your favorite and 2) your favorite small ways to spread love in the world. Bonus points for sharing a recipe for the spread (if applicable) so we can try it ourselves! Make sure to complete & post your assignment before you go to bed next Thursday night if you want your work to be considered for a feature in my Instagram Story. Can’t wait to see what you whip up this week! PS Here is a recipe for a yummy Beet & Feta dip I made the other day that blew my mind! It's creamy, tangy, and a beautiful hot pink color.